Transconjunctival Lower Eyelid Lift Before and After with Canthopexy. This woman in her late forties had tired looking eyes with large bags and lateral canthus (outer corner of eye) rounding that happens with age. 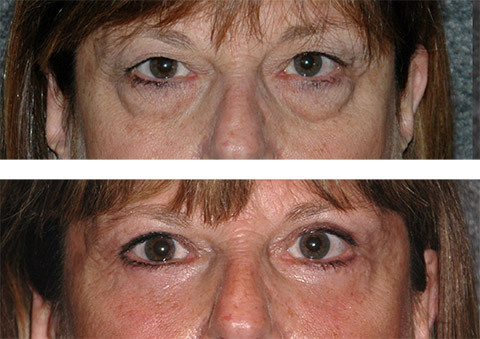 Doctor Jacono performed a fat transposition lower eyelid lift moving the fat bags under the eyes into the tear troughs. He also performed a canthopexy to tighten the drooped corner of the eye recreating a more youthful almond shaped eye. 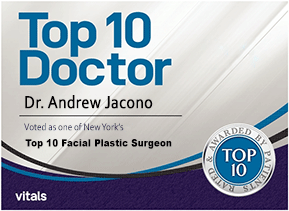 Lower eyelid surgery is a cosmetic procedure that Dr. Jacono performs to rejuvenate the appearance of aging eyelids. As the lower eyelids age, five main changes occur creating an older and sometimes tired or sad appearance. Superficially, loose hanging skin develops creating wrinkles under the eye lashes leading to crow’s feet toward the outer corner. The orbicularis oculi muscle around the eye becomes looser creating hanging that is referred to as a festoon. 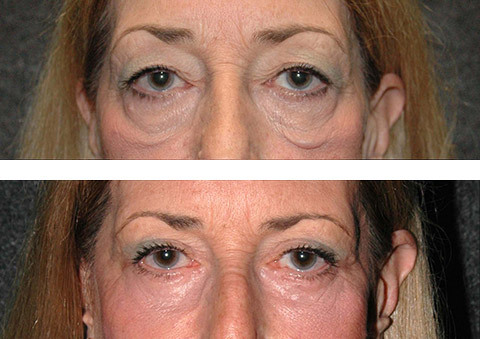 Eyelid puffiness develops that is the result of excess fat pockets called orbital fat. Dark circles develop immediately beneath these fat pockets as volume is lost in the upper cheek. This is often referred to as the tear trough and is a hollow that collects shadows. This will leave the bony rim of the eyes to become more exposed and create a hollowed appearance to your face. These changes will make you appear to be older than you are and look tired and fatigued. Lastly, the outer corner of the eye called the lateral canthus loosens, creating a downturn associated with puppy dog sad look. Your cheeks will also give way to the aging process and start to descend to a lower position. Not everyone develops all of these problems, so Dr. Jacono tailors lower eyelid surgery to the individual problems of each patient. Not overdoing lower eyelid surgery is the key to maintaining the character and identity of your eyes. What Happens to the Lower Eyelids As We Age? Lower Eye Lift Before and After. This woman in her late forties wanted to lift her drooping cheeks and nasolabial folds and recreate a tighter jawline and get rid of her jowls. 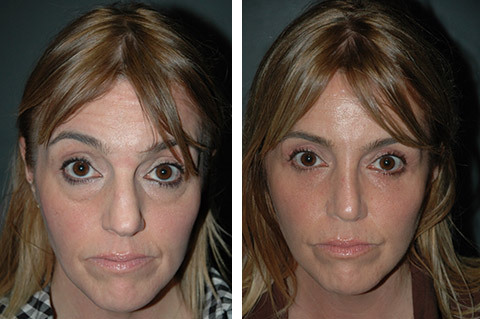 She had a mini facelift with a deep plane facelift of her fallen facial musculature. A short scar facelift incision was used so the incisions are hidden on the inside and behind the ear so the hair can be worn up with a ponytail. She has her upper eyelid lift and lower eyelid lift with a fat transposition to fill her under eye circles performed at the same. Why a Lower Eyelid Surgery? The lower eyelids can be rejuvenated with a non-surgical eyelid lift by injecting hyaluronic acid filler in the hollowed out tear trough under the eye to camouflage the puffy eyelid bags above it. Botox can be added to smooth out eyelid wrinkles. This approach will often work for patients through their forties. As we continue to age, the eyelid bags become too large to hide with filler injection, and the skin too excessive to smooth out with Botox. For some people they have a genetic predisposition for lower eyelid bags and develop these changes earlier in life, sometimes as early as the thirties. When non-surgical methods do not work as well is when to consider lower eyelid surgery for more permanent fix. Lower eyelid surgery results last 15 years or more, as opposed to 6 to 12 months for a non-surgical eyelid lift. Interestingly, the cost of repeated injections over 10 years will cost 3 to 4 times the cost of a lower eyelid lift surgery, so surgery is actually more cost-effective in the long run. 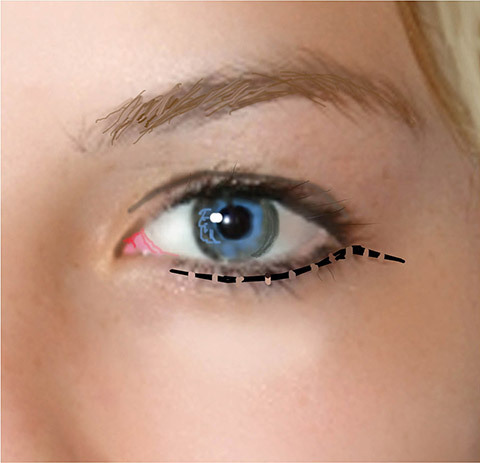 Lower Eyelid Lift Incision Types. The bags under the eyes can be approached through an incision placed inside the eyelid called a transconjunctival blepharoplasty or just below the eyelashes called a transcutaneous blepharoplasty. The decision to make the external incision depends upon how much skin needs to be removed. A lower blepharoplasty is the medical term for a lower eyelid surgery and it involves the removal of the excess sagging skin, muscle, and fat or the lower eyelids. This procedure can be performed as an outpatient procedure and even done under local anesthesia. Doctor Jacono does not use general anesthesia for this procedure, but will use twilight anesthesia with IV sedation if you want to be asleep. Avoiding general anesthesia reduces risks and also prevents you from feeling sick and nauseous after the surgery. Dr. Jacono will begin the procedure by carefully placing an incision either immediately beneath the eyelashes or for some cases he will place the incision on the inside of the lower eyelid. When Doctor Jacono places the incision on the inside of the lower eyelid the procedure is called a transconjunctival lower blepharoplasty, when placed externally it is called a transcutaneous lower blepharoplasty. In both cases, the incision will be virtually invisible. The decision whether to place the incision inside the eyelid or on the outside has to do with the amount of skin that requires tightening. When less skin tightening is required a laser resurfacing can tighten the skin and the work on the eyelid bags can be done internally. If there is a lot of excessive skin, it needs to be trimmed like hemming long pants so an external incision is necessary. Because the incision is 1 millimeter form the eyelashes, it is virtually invisible. 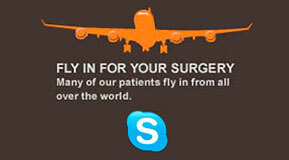 Doctor Jacono determines the approach utilized during your pre-operative consultation. He makes every effort to use the internal approach if you are a candidate. 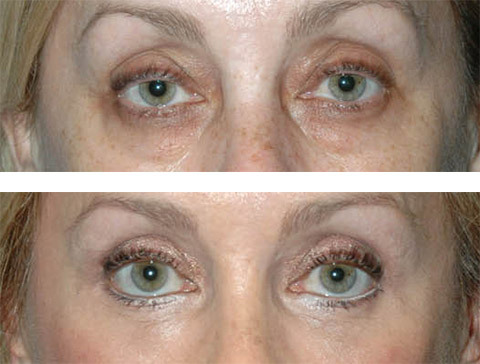 Transcutaneous Lower Blepharoplasty Before and After. This patient in her late forties is a sun worshipper with fair skin that developed significant wrinkling and excess skin. 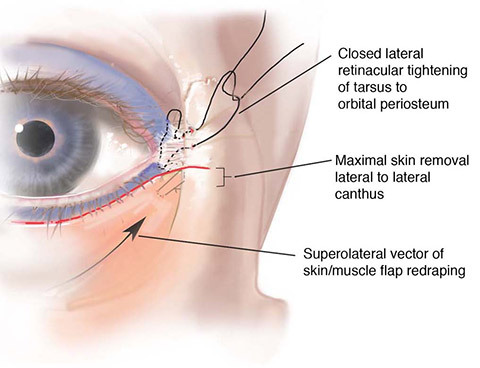 In addition to repositioning her orbital fat, he needed to remove a large amount of excess skin requiring an external incision under the eyelashes. The incisions heal well in just a few weeks as you can see in this picture. Fat Transposition Lower Blepharoplasty – Instead of removing the fat bags under the eyes which creates a hollowed out, plastic and “done” look, Doctor Jacono transposes the orbital fat down into the tear trough. This is the hollowed area underneath the eyes that creates dark circles. In this way both the bags are removed and the hollows filled in one procedure. 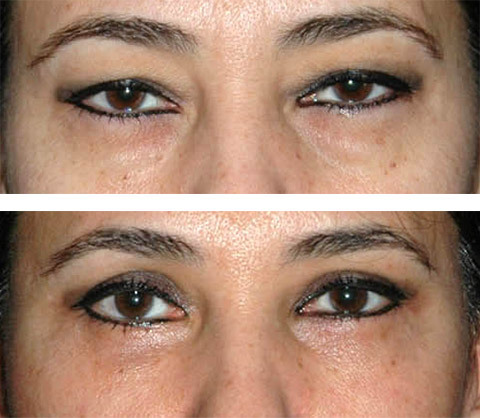 Lower Blepharoplasty Before and After with Fat Transposition. This woman in her 50s had bags under her eyes and hollowing in her upper cheeks. Doctor Jacono performed a transconjunctival fat transposition to fill her tear trough and remove her lower eyelid bags. Doctor Jacono does not believe in simply removing fat bags from under the eyes because it will create a hollowed out look that makes you look like you had your eyes done. Even though you do not have bags it makes you look older. Instead after accessing the fat from an internal or external approach, doctor Jacono will reduce a small amount of fat, but repositions the rest inferiorly into the tear trough or hollowed out area under the eye above the cheeks. Refilling the dark shadows under the eyes makes the eyes appear youthful while getting rid of the bags. 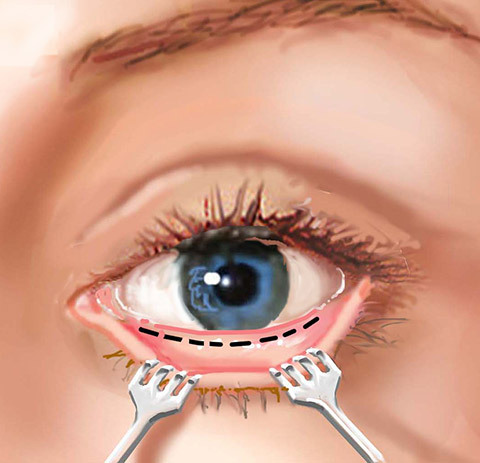 This technique is called a fat transposition blepharoplasty, and Dr. Jacono has recently published his modification of the lower eyelid lift technique in the peer reviewed plastic surgery journal JAMA Facial Plastic Surgery (Journal of American Medical Association). Festoon Correction Before and After. This woman in her mid 60s had more significant drooping of the eyelid muscles called festooning. To repair this Doctor Jacono performed a transcutaneous blepharoplasty with a skin muscle flap to target the excess muscle, lift and remove it smoothing excessive festoons. Many plastic surgeons do not repair festoons as it is a more complex muscle repair. Canthopexy Procedure. Doctor Jacono will often incorporate a procedure to tighten the lateral canthal tendon of the lower eyelid to support it as it weakens with age. This helps prevent lower eyelid shape change after lower blepharoplasty. He can also recreate the almond shaped eyes people had in youth. He routinely asks patients to bring photos of themselves from years ago so he can recreate that shape during the lower eyelid lift. 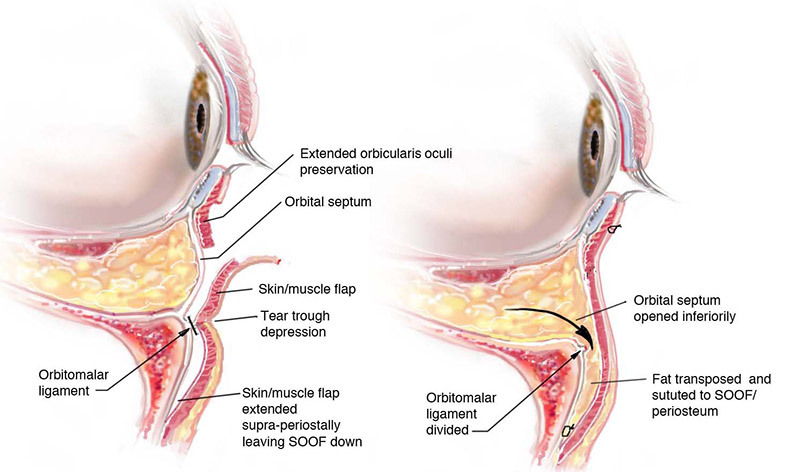 After the orbital fat has been treated, the drooping eye muscle called the orbicularis oculi muscle must be tightened. Loose orbicularis muscle creates a festoon or hammock of muscle below the eyelids. This can be treated with a suture or stitch tightening called an orbicularis hitch or sometimes requires the muscle to be completely lifted and excess removed when eyelids are more aged. 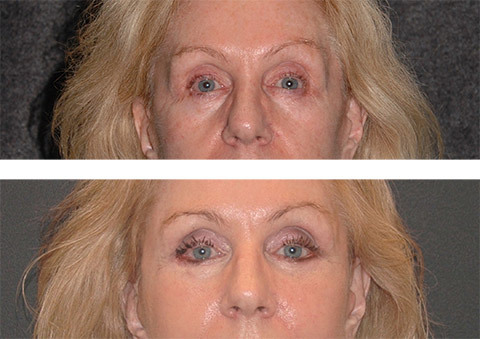 This is called a skin muscle flap blepharoplasty. More muscle work will create more bruising after surgery. A common problem after lower eyelid surgery is a change in the shape of the eyelids, with the corner pulling down called ectropion. Doctor Jacono performs revision lower eyelid surgery so he knows how to prevent this problem with a procedure called a canthopexy. During the lower eyelid surgery, he will strengthen a tendon in the eyelid called the lateral canthal tendon with a dissolvable suture so that the eyelid does not pull down while the eyelid heals. If patients notice that their eyelids shape changed as they became droopier, for example losing the almond shape of youth for a more rounded eye, he will perform a canthoplasty with a permanent suture to maintain the new shape. Fat Transfer to The Lower Eyelids – When is it Necessary? Some patients only develop extra skin, loosening of the lower eyelid muscles, and hollowing of the eyes but do not develop any lower eyelid fat bags. Others may have had a prior lower eyelid surgery that removed the eyelid fat and now look hollowed out. In these cases Doctor Jacono will perform fat grafting often referred to as a fat transfer where fat is removed from the abdomen, hips or thighs and injected into the tear trough. This fat is not as smooth or viable as fat from the orbit, but is the next best substitute if no fat is present to fill hollowed under eye circles. The skin and muscle are tightened similarly as described above during the fat transfer. Fat Transposition Lower Blepharoplasty with Orbicularis Muscle Tightening. This woman in her late fifties had large orbital fat pockets. Doctor Jacono removed some of this fat and transposed the remainder to the tear trough. Her eyelid muscle was drooping as well so he performed a skin muscle flap to redrape and remove the excess muscle. The lower eyelid procedure will take approximately one but surgical time is dependent upon what type of procedure Dr. Jacono is performing. For some patients, Dr. Jacono will also perform an upper eyelid procedure to complete a total eye rejuvenation. It is not unusual for patients to choose to have complementary aging procedures such as mini facelift and neck lift to complete the overall facial rejuvenation. Bruising usually lasts 7 to 10 days, Doctor Jacono has specialized makeup to cover bruises after plastic surgery. Fat Transfer to Lower Eyelid Combined with Lower Blepharoplasty Before and After. This woman in her 60s had hollowed eyes with aging but had no eyelid fat to fill her tear trough. Doctor Jacono performed a fat graft injection to fill the sunken eyes as well as tightened loosening eyelid muscle and removed excess skin. The result is more youthful appearing eyes. Men and women who have puffy bags under their eyes and/or excess lower eyelid skin, may be a candidate for a lower blepharoplasty. The best candidates are in good physical health, are non-smokers, and willing to follow specific post-surgical instructions. 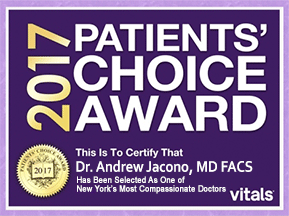 To see if you are a good candidate, the best first step would be to schedule an in-person consultation with Dr. Jacono at one of his two New York locations. During your consultation, you will be able to discuss your concerns and surgical goals with Dr. Jacono who will then help to create a custom solution to give you the best surgical outcome that is aligned with your expectations. 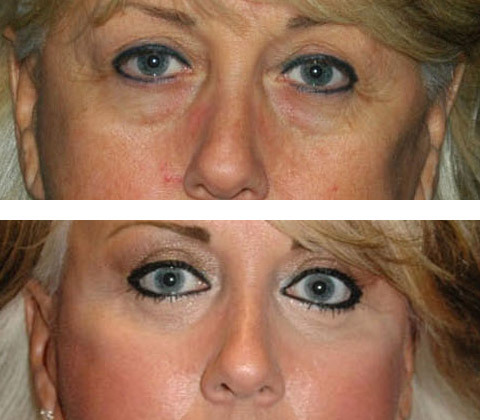 Lower Eyelid Patient: Dr. Jacono performed a deep plane facelift and a lower blepharoplasty to address her concerns. 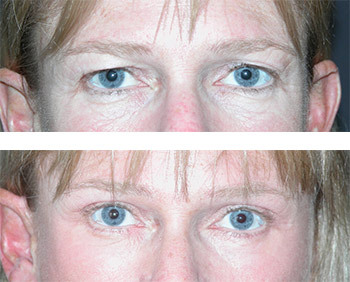 Dr. Jacono also repositioned the lower eyebags to reduce the appearance of her dark eye circles. Her after photos show her cheeks have been lifted to reverse the drooping affect and the hollows under her eyes were smooth and filled. She looks natural and decades younger. 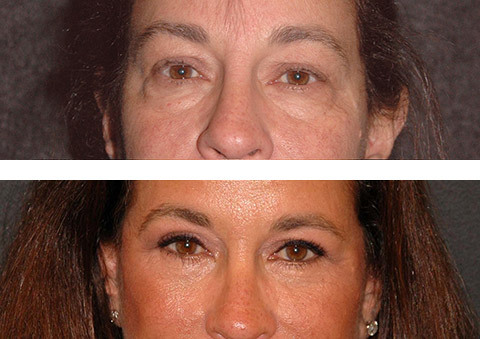 Lower Eye Lift Patient: This patient is 1-year post-operative and in her early fifties. She wanted to look younger and more rejuvenated. Dr. Jacono performed a deep plane facelift procedure combined with a neck lift, platysmaplasty, lateral temporal lift and a lower blepharoplasty with orbital fat transposition. Her after photos show her looking natural and refreshed. Not pulled or too tight. If you would like to learn more about lower eyelid surgery options, or to schedule your in-office consultation with Dr. Jacono, please complete an online consultation form and one of his patient coordinators will help to schedule your appointment. Alternatively, you can call his New York City location at 212-570-2500 or his Long Island center at 516-773-4646.